This post is sponsored by the Wente Vineyards but the content and opinions expressed here are my own. This post contains affiliate links. This is an easy tutorial on how to make antipasto board (antipasti platter) table runner. Impress your friends with this beautiful display of Antipasto foods. This delicious platter is paired with wine. Wine plus dinner equals winner. In the beginning, I was terrified to start a food blog. A blog puts yourself out there for the whole world to see. 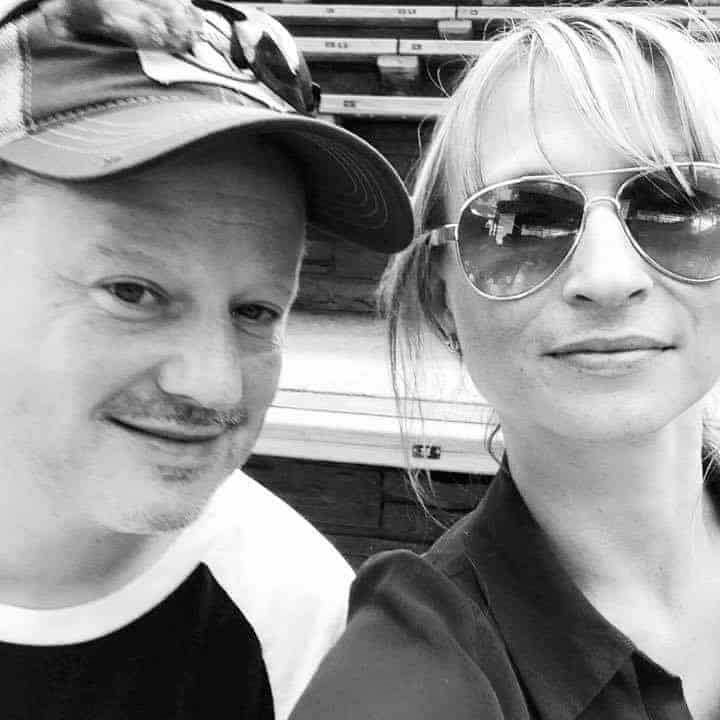 I would think to myself, “What if no one goes to my blog? What if they hate my pictures? What if they hate my recipes? What if I fail?” And if I fail, all the people I know will watch me fail. As a half-hearted introvert, this was a difficult hurdle for me to overcome. 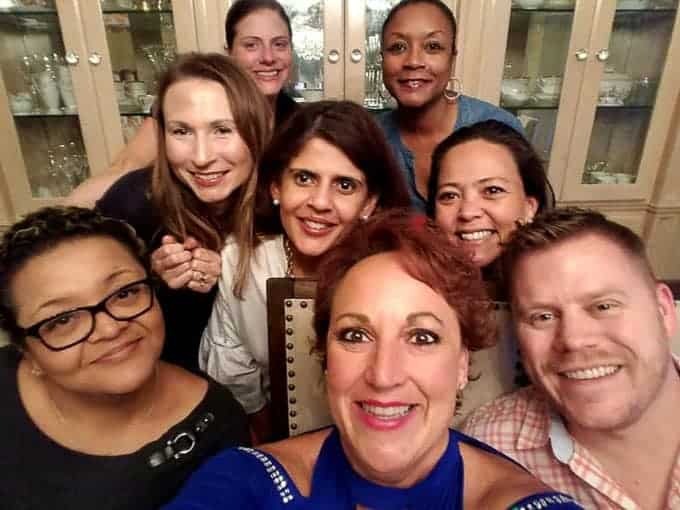 It was my husband’s and friends’ encouragement that pushed me forward to take that big leap. It was their little whispers of “Great job!” or “I love those pictures!” or “This dish is incredible, when does it go on the blog?” That kept me going. Their support has been endearing and it is so special to share my journey of blogging growth with them. One of my favorite things in the world to do is eat good food and drink good wine with my friends. One of my closest friends, Angie, loves to nibble on a bunch of different foods instead of eating one dish. So when she comes over, we are typically opening a bottle of wine and I am putting out a bunch of different cheeses, meats, and homemade dips. Then I thought to myself, wouldn’t it be cool to make antipasto table runner for all of my friends to gather at the table around? I went to Home Depot and picked out a nice sized piece of wood that wasn’t too thick or thin. I sanded it down and treated it. Super easy!!! You can also go to a local lumber store and they can cut it to the exact size you want. Here is an easy video tutorial on how to make antipasto (antipasti platter). 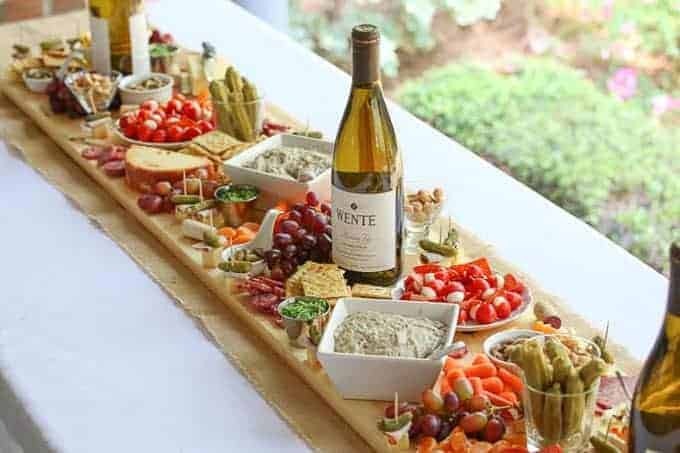 Impress your friends and guests with this beautiful display of your favorite Antipasto foods as it runs down the center of your table on your homemade board. What do you put on an Antipasto Platter? How to arrange an Antipasto Platter? Arranging your antipasto platter should be fun! You can plate in big groupings such as putting all your meats together, all your pickles together, and all your cheeses together. Or you can spread your food out in small plates and scatter throughout the board. I like to do this so that everyone has access to all the dishes no matter where they sit. I break up the small plates, meats, cheese, etc and scatter them in small dishes or directly on the board all throughout until it is completely filled. I think this makes the board not only beautiful but more interesting. DON’T FORGET THE WINE! 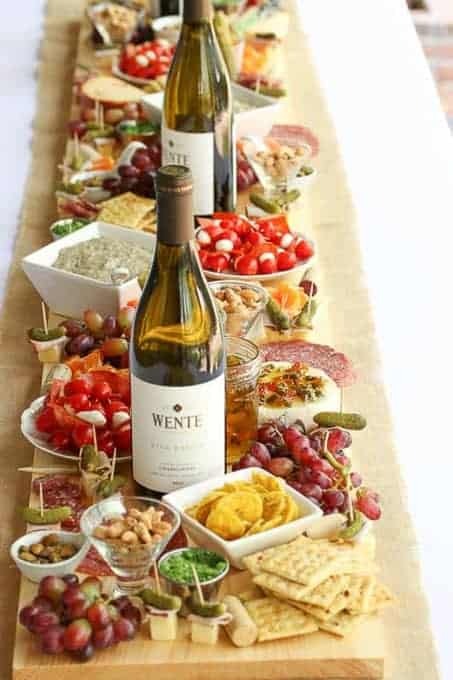 I paired the lovely Wente Vineyards Morning Fog Chardonnay and Wente Vineyards Riva Ranch Chardonnay with some of my favorite antipasto foods and invited my friends over. The perk to being a friend of a food blogger is you will eat and drink well! 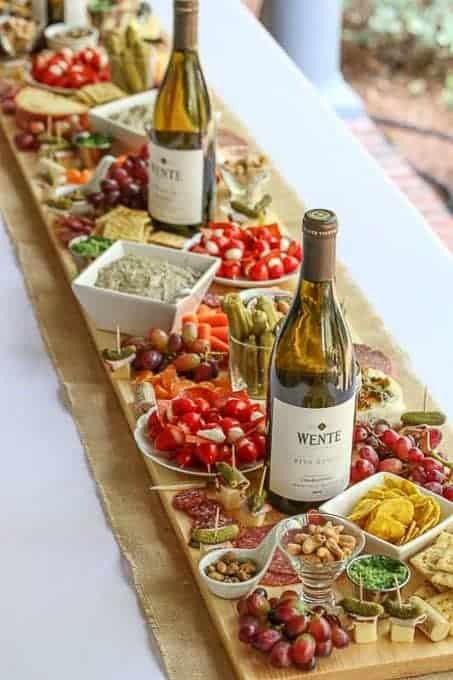 My friends loved the Antipasto Board Table Runner and the Wente Vineyards Chardonnay. The Wente Vineyards Riva Ranch was smooth and balanced with notes of lemon, apple, and vanilla. The Wente Vineyards Morning Fog is full bodied with hints of oak, apple, and honey. I highly recommend both bottles for entertaining! You really should measure the table you will be using it on and find a board size you want to use based on your table. I have a very long and wide table. That board would not work on every table. Do you know the measurements you used? How much food do you buy, I want to do one for Thanksgiving, 30-40 people. I used the Butcher Block conditioner. It is the image below the video. What did you treat the antipasto board with? It would have to be something that is food safe if I am correct, right? I am wanting to make one of these. I am so glad you enjoyed this. I use my Antipasto board often because there is something special in sharing food with each other. xoxo! I loved this. 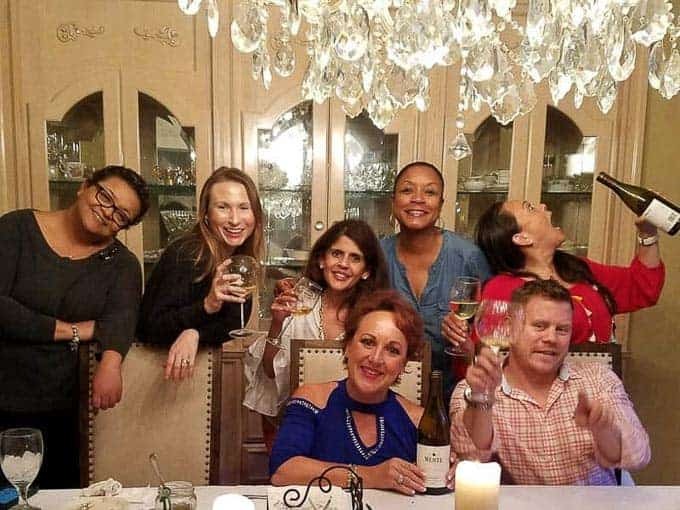 Wish I was invited. 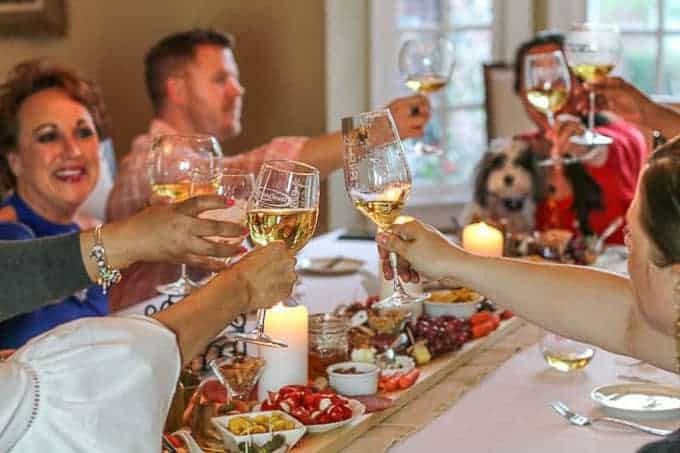 I have alway wanted to do a christmas lunch on my patio where all the food is lined up in the middle of the table and the dishes are just passed arround with everyone helping themselves like in Italy, France, etc. We have glorius summers in South Africa and some times we get wonderful rain to cool us down or we dip ourselve in the pool. Seeing this guess what I am doing this Christmas…….. LOVED your post! This day looks like heaven :). Would love it if you would check mine out as well!